Home > Laptops > Dell Laptop Computers > Dell Latitude 5480 14"
Dell Latitude 5480 14” Laptops are an excellent mobile business computing solution for Small to Medium Size Businesses (SMBs) looking for a versatile and customizable laptop for their end users! The Latitude 5480 Laptop keeps up with your changing application needs over time with the scalable performance of the Intel Core i5 and i7 7th generation processors, DDR4 memory scalable up to 32GB, and storage options in SATA for high capacity and Solid State Drives for faster performance. This powerful and scalable laptop is also highly secure! 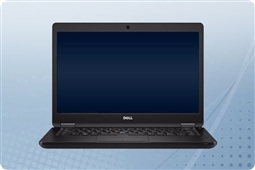 Leveraging the best in new Dell security features the Dell Latitude 5480 laptops include security and manageability benefits such as multi-factor authentication, Dell ControlVault, Dell Intel vPro extensions, and automated BIOS and system configurations. Plus with up to 12 hours of battery life and an amazingly durable chassis the Dell Latitude 5480 makes sure your user’s can stay productive no matter where they are working! Aventis Systems provides a standard 1 Year Essentials parts replacement warranty on all of our Dell Latitude 5480 Laptops. Optional upgrades are available as well to Extended term, Secure Drive media retention, and Express NBD parts replacement warranties for more coverage. So shop our product options below and customize the perfect scalable and secure business laptop solution for your company today with the Dell Latitude 5480 14” Laptops!